Saudi Arabia has no movie theaters. Clerics oppose public screenings because they encourage mingling of the sexes. Small wonder that it has taken until 2013 to get Wadjda, the first feature shot entirely in Saudi Arabia. In a country where a film industry is virtually absent, this fact alone would make its existence commendable. However this is also the first feature-length picture made by a female Saudi. That makes it an extraordinary accomplishment even before a single frame is viewed. Although I’m happy to proclaim that the production is a laudatory achievement in its own right. Wadjda is a 10-year-old Saudi girl from the capital city of Riyadh. She lives there with her mother (Reem Abdullah). She has a father (Sultan Al Assaf) as well, but her relationship with him is confusing. We grow to understand he is seeking a second wife, which is why he is seldom at home. Wadjda watches the boys ride their bikes in and around town. She yearns to own her own cycle. Every day on the way to school she passes by a store where she spies one beautiful new bike for sale. She longs to buy the expensive vehicle and race against her friend Abdullah, a boy from the neighborhood. This is Wadjda’s effort to raise the money. 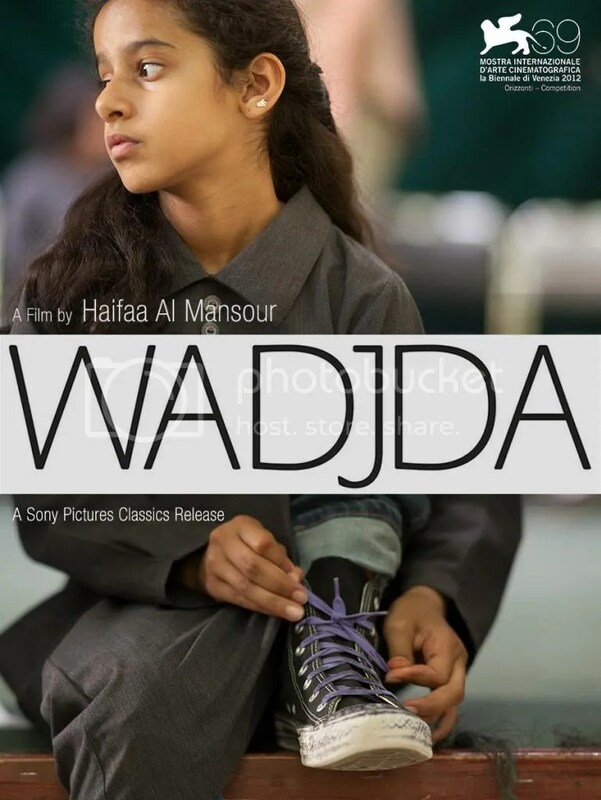 Wadjda does more than just tell a compelling story. It is a cultural record. We learn women cannot vote, laugh outdoors, or even be seen by men unless covered. Women are pressured to wear a full-length black covering called an abaya. Saudi Arabia is the only country in the world that prohibits women from driving. Rights are dictated and defined by Sunni Islam and tribal customs. Yes, director Haifaa al-Mansour’s work is politically charged, but not in the way you think. It’s refreshingly subtle. It merely presents society without comment. The viewer is freely allowed to criticize or support what they see. To western audiences unfamiliar with such customs, they will seem intolerable, but the production surprisingly feels charming and light. Credit young actress Waad Mohammed who plays our titular heroine. She embodies sweetness and grace with just a smidge of tomboy. Needless to say, the idea of a little girl riding a bike is something frowned upon here as it is seen as detrimental to a girl’s virtue. Writer-director Haifaa Al-Mansour does the impossible. She has produced a film in a country with no film industry to speak of. Add that she is female in a community where women are forbidden to publicly interact with unrelated men. Wadjda is fascinating because it does two things brilliantly. One, it offers a gripping narrative of a captivating character. Secondly it also serves as a document of Saudi society. The director even fashions a climactic Koran recital contest as an edge-of-your-seat nail-biter. We get an expert’s view from the inside. The presentation of culture was a real eye opener for this critic. The strict moral codes might be described as oppressive, yet the milieu never reads that way. Joyful, effervescent and uplifting, this is about the triumph of the human spirit. How one rebellious little girl deals with her innocent desire to simply own a bike. Saudis can still watch movies via satellite, DVD and video in the privacy of their own homes. Perhaps one day they will be able to see this in a cinema. You however don’t have that problem. Please exercise that right and see this film. This entry was posted on October 23, 2013 at 8:00 pm and is filed under Drama, Foreign with tags 2013. You can follow any responses to this entry through the RSS 2.0 feed. You can leave a response, or trackback from your own site. Thank you! Hopefully it can secure a nomination for the foreign language Oscar. I really hope this gets a wider release. As of now I think it’s only playing in about 80 theaters across the U.S. I would guess the Oscar nom is likely, if not almost certain. The press I’ve read has it as one of two favorites to WIN the award. Honestly, the movie is so good and the cause so screams liberal Hollywood that I wouldn’t be surprised if it gets nominations outside of the Foreign Language category. Forecasting this award is next to impossible. Best Documentary Feature is the only award more unpredictable. As such, I’m not as certain as you. The Hunt from Denmark has gotten a lot more press. One thing working in Wadjda’s favor: it has the right distributor. Sony Pictures Classics has won four consecutive and, I believe, six of the last seven Best Foreign Language Oscars. The Hunt is distributed by Magnolia. Promotion is everything so your observation is a very good one. It is. Hope you enjoy it. These are the kinds of films I like to promote on my blog; ones that don’t get a lot of promotion. This is why your blog is one of my favorites b/c you do the same. I will have to check this one out, but will more likely be a rental since I doubt it comes to my city. But who knows, maybe in a few weeks it will. Our theater shows independent and foreign films. Unfortunately this will have to be a rental for many because foreign films rarely get a wide release. Every once in a while something like Crouching Tiger, Hidden Dragon come along and rewrites the rules, but that’s the exception, not the rule. Definitely one of my favourite films this year. Nice review sir. Thank you. It’s a special film. Great review, Mark. First I’ve heard of this movie; sounds very interesting. The first, and hopefully not the last. Saudi Arabia’s culture is very different than ours. This movie displays the do’s and don’ts for women there. I don’t agree with it, but that’s their life. This film was very informative and good. I loved the story and was really moved. I’m so glad I had the opportunity to see this. Loved it! 4 1/2 stars. I love when a film inspires me to do research about a subject and I love when a movie still has me thinking about it days after I’ve seen it. Wadjda did both. Sounds like a groundbreaking achievement and a great film. It’s really great when the two can coincide. Excellent review Mark. It seems to have peaked at the theaters. As soon as it’s available on video, I’d rent it immediately.